Brainwashed - Zu93, "Mirror Emperor"
SURE, EVERYTHING IS ENDING, but not yet. Ever since David Tibet's Current 93 sung its birth canal blues back in the early 1980s, there's been a smell of apocalypse in the air. As the American author of horror novels Thomas Ligotti put it, Tibet has over the years presented us with words and images that are "portentous in a literal and most poetic sense. "* No matter how great or small, Tibet's visions has sustained a sense of urgency throughout his many, many projects and towering work. 35 years on, as dark clouds once again are gathering on the horizon, his syncretic tale of the fallen empire inside us all seem to be as pertinent as ever. Arise for bad times. Enter Zu93, the effectively named collaboration between Tibet and the ever-changing Italian group Zu, centered around Massimo Pupillo and Luca Mai. Seven years after the collaborators first met in Rome, the most beautifully apocalyptic city of all, they can finally present Mirror Emperor, mixed and produced by Stefano Pilia. If last year's Create Christ, Sailor Boy, the startling Hypnopazūzu album Tibet made alongside Youth, the legendary producer and Killing Joke bassist, was "a transformative union," the imperial ghost music presented on Mirror Emperor marks a return to their earth, a tour amidst the ruins: Gentle guitars, weeping cellos, the occasional rumbling bass and soft percussion, are melted and gently poured into the sepulchral engine. Despite a few electric swirls or the odd metallic screech Mirror Emperor moves seamlessly and comes across as surprisingly grounded and subtle, yet anticipatory, foreboding and at times even pastoral and Arcadian. The sound of a magical chamber orchestra or Cæsar Legions? Well, Mirror Emperor does echo pivotal moments from the respective catalogues of its creators, most urgently akin to Zu's acoustic explorations on their 2014 collaboration with Eugene S. Robinson of Oxbow fame, The Left Hand Path, leading up to last year’s brilliantly metamorphic Jhator. 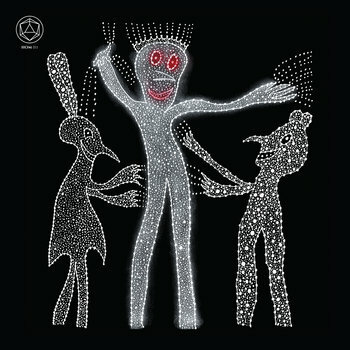 For others the album will come as a gift from the blazing starres, more than hinting at a stripped down Current 93 of the 90s, perhaps in the same way as 2010's Baalstorm, Sing Omega or Myrninerest's 2012 album, 'Jhonn,' Uttered Babylon at times did. As the music fades out, we hear a whispered "awake." “Every time I heard this final call to awakening while working on the album, I found myself deeply moved," Pupillo says. "Awake. If this was the last word to come out of Zu, I would be a happy man." What we're left with is a dreamlike suite, created under a murderous moon. Perhaps that is all we ever hoped for. Hey, was that the Apocalypse?